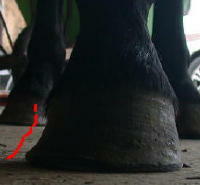 This is a Left Front foot with the inside wall curving to the inside, in a bell-shaped fashion (red dotted line Fig. 2). 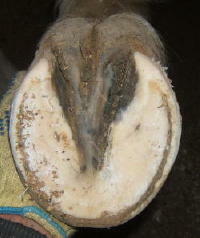 This is being caused in part by the sole at the inside toe which is too high (Fig. 1) as well as the toe too long. 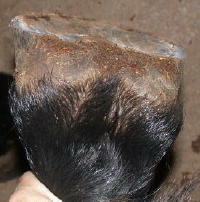 This young mustang, never shod, has very thick and extremely hard walls which do not break off with wear but continue growing in a distorted way, and altering the horse’s stance. 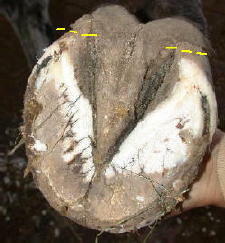 The trimming treats this condition similarly to a flare but also lowers the toe on the inside (sole is removed). So, there are cases when sole forward of the frog does need to be rasped. The trimming is complicated by the inside-growing direction the walls have adopted. Now that the inside wall is growing more correctly, the outside wall needs to begin to start growing in a more outwardly direction (more visible in Fig 3 due to the angle of the photograph). 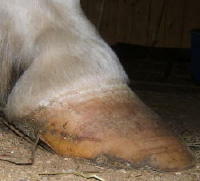 Advanced trimming techniques such as floating the heel and the diagonal toe will allow this to occur. 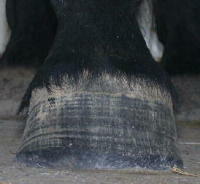 A photo from an early trim shows how all the pressure was put on the inside wall by the long toe, with all the compression rings on the inside only. 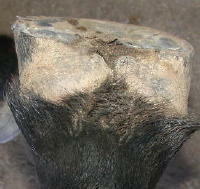 Here is an example of overgrown bar that has migrated forward onto the sole creating the appearance of a ‘false’ or ‘double’ sole. The material is not merged with the sole and is distinctly different in appearance and texture. The bars are brought back to their correct position ending alongside the collateral grooves and approximately to the midpoint of the frog. Also note the expansion of the contracted heels. These pictures are courtesy of a barefoot trimmer in the Midwest. 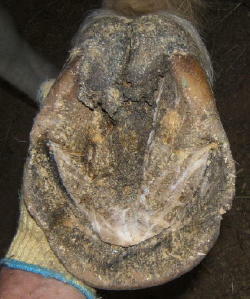 The foot starts out with very poor hoof form, and in fact the horse was lame at the time of the before photo. 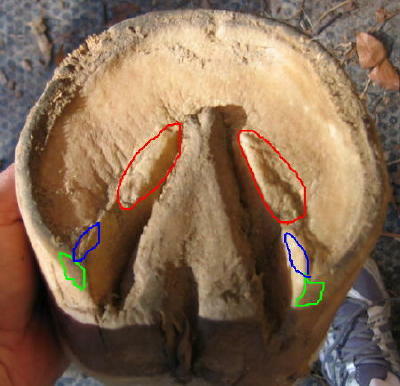 The lateral cartilage (1) is unnaturally pushed up and and bulging out of the back of the hoof capsule, the heel (2) is too high and forward and the lateral quarter (3) is too long causing the flare and chipping. But the most glaring problem is the steep pastern angle (red line) resulting from the heel height and location and toe length. 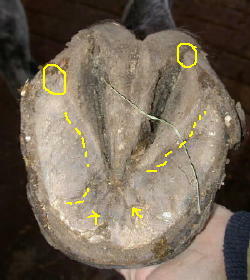 It is commonly believed that the pastern angle is fixed and the hoof should be trimmed to match it. 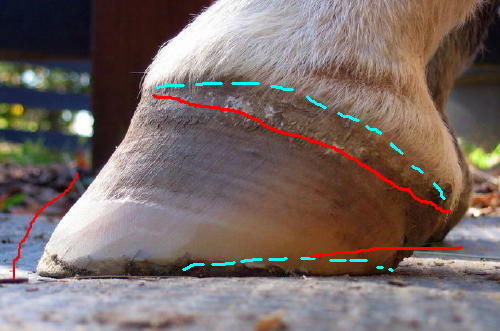 This is a misconception, as the joint is mobile and the angle easily altered according to the hoof form, provided there is no joint adaptation and the joint still retains a normal range of motion. 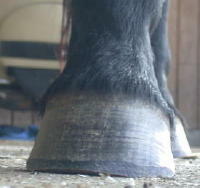 In this case the pastern angle was changed to a much healthier alignment in two trims by lowering the heels, bringing them back towards the widest point of the frog, shortening the quarter walls, and shortening the toe. 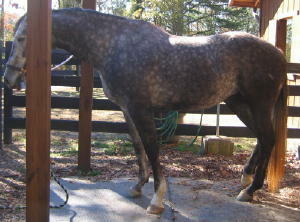 The horse is a lovely 3.5 yo Irish Draught Sport Horse. Bars below midpoint of the frog, to apex of frog, should be smoothed out level with the sole (shown in red). This will remove a source of pain. 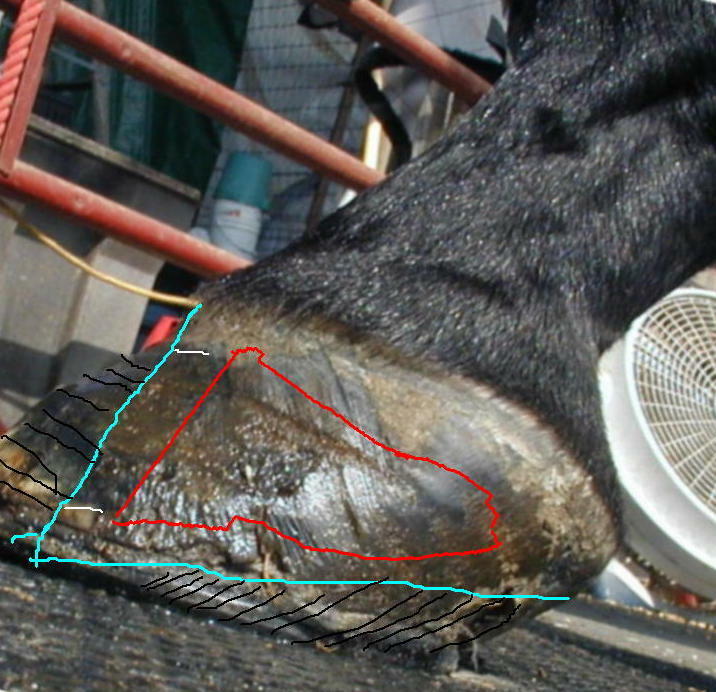 The horse’s current hoof form is not allowing him to grow a healthy The markup shows the approximate location of the coffin bone and what it’s doing to the tissues and vessels in the foot. 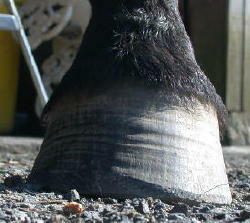 Reported problems include very little hoof growth, very thin soles, and very little heel to remove. In reality there is a great deal of heel here that needs to be removed (as per markup). Its height is pathologically displacing the coffin bone. 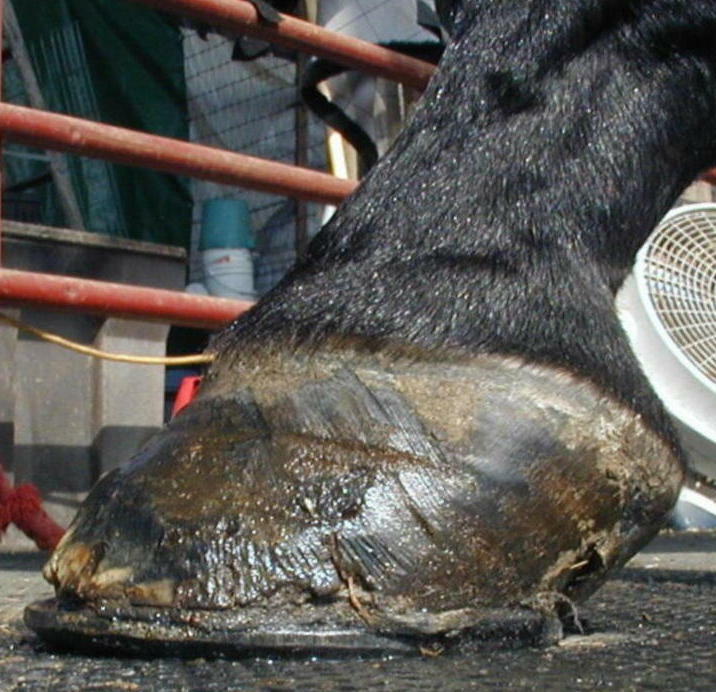 This orientation is the reason for the lack of hoof and sole growth, and the laminar wedge. The tip of the coffin bone is pointing down onto and compressing the circumflex artery, the only blood supply to the sole which is responsible for the thin soles and poorly growing, crumbly walls, and the front of the coffin bone is pressing on the sole. Pressure prevents growth. At 4 mm, the soles are actually only 1mm less than the thinnest recommended amount (5mm), the issue is more the sinking of the bone onto the sole. As long as the circulation is compromised by the pathological orientation of the coffin bone, the laminae cannot reconnect at the top between coronary band and top of P3. The tip of P3 at the extensor process is also being pushed against the blood vessel that would supply the blood to the laminae. 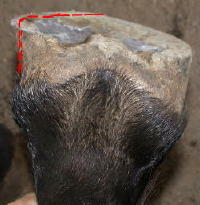 The downward pointing tip of the coffin bone causes the laminar space to be much wider at the bottom than at the top; as long as this condition exists, the laminae will not reattach in a healthy fashion and rotation and a laminar wedge will continue to be present. The laminar space at the bottom needs to tighten up to the same width as at the top, so that the laminae are not stretched and torn beyond their natural capacity and continue to secrete blood and inflammation. 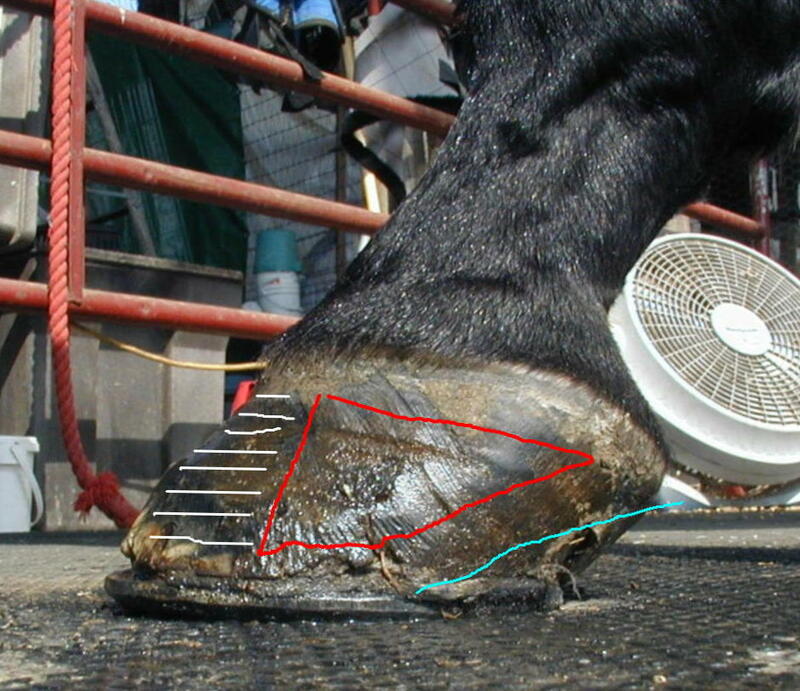 This needs to be done by lowering the heel to where the blue line is.